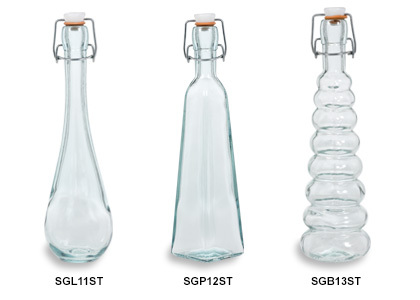 Our recycled Spanish glass swing top bottles make beautiful additions to the pantry, shelf or kitchen counter. These wholesale swing top bottles are excellent for making and storing liqueurs or herb-infused oils. The names of these bottles reflect their Spanish origin and unique shapes and feature the classic swing-top bale made of galvanized steel with a white cap and red gasket.